A Harvard University journal says it hasn't fully verified research that purportedly shows some early Christians believed Jesus had a wife, even though Harvard's divinity school touted the research during a publicity blitz this week. The research centers on a fourth-century papyrus fragment containing Coptic text in which Jesus uses the words "my wife." On Tuesday, Harvard Divinity School professor Karen King announced at an international conference that the fragment was the only existing ancient text in which Jesus explicitly talks of having a wife. Harvard also said King's research was scheduled to be published in the Harvard Theological Review in January and noted the journal was peer-reviewed, which implied the research had been fully vetted. But on Friday, the review's co-editor Kevin Madigan said he and his co-editor had only "provisionally" committed to a January publication, pending the results of the ongoing studies. In an email, Madigan said the added studies include "scientific dating and further reports from Coptic papyrologists and grammarians." After Tuesday's announcement, The Associated Press raised questions about the fragment's authenticity and provenance, quoting scholars at the international congress on Coptic studies in Rome, where King delivered the paper. The scholars said the fragment's grammar, form and content raised several red flags. Alin Suciu, a papyrologist at the University of Hamburg, flatly called it a "forgery." Boston University archaeologist Ricardo Elia said Friday that the Harvard Theological Review should delay publication until the fragment's owner and origins are more clearly documented. Harvard has kept the owner anonymous, and Elia said that raises questions about professional ethics, because Harvard appears to be protecting the owner, a collector, from other claims to the fragment. The school has said the papyrus most likely came from Egypt, which means it could be Egypt's cultural property, Elia said. "If it's real, it was looted and smuggled, most likely," he said. "If it's not real, then it shouldn't even be out there in the discussion." Elia said "lurking behind all of this is the suspicion that the collector is doing this for the purpose of having the scholar authenticate a piece, and get a lot of attention to it, and then turn around and sell it." King's announcement about the fragment, which she called the Gospel of Jesus's Wife, came after the school released details in advance to The New York Times and The Boston Globe, which gave the story prominent play. The Smithsonian Channel is planning to debut a program about it at end of the month. 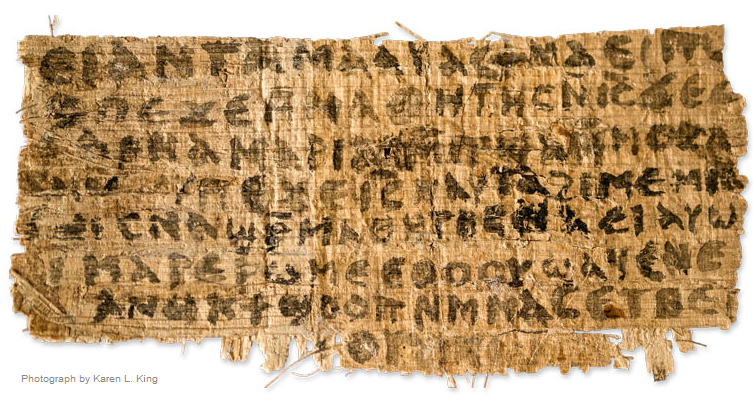 Text on the papyrus fragment, written in the language of early Egyptian Christians, records Jesus referring to a woman, Mary, as "my wife," and later saying, "She can be my disciple." King emphasized the 1.5-by-3-inch fragment was not proof Jesus was married, just evidence that some early Christians thought he was. Christian tradition holds that Jesus was unmarried. Evidence to the contrary, or that he had a female disciple, would fuel debate over the role of women in the church. King said further testing would be done on the fragment, including ink tests to determine if the chemical components match those used in antiquity. King also took the fragment to two papyrologists who determined it was very likely authentic. One of the experts, AnneMarie Luijendijk, of Princeton University, said papyrus fragments often don't have provenances because many were taken from Egypt long before that was a major concern. The Vatican newspaper and Vatican Radio frequently cover academic conferences like the one King attended, but there was no mention of King's discovery in any Vatican media on Tuesday. Associated Press writer Nicole Winfield contributed to this story from Rome.